Long Island Scientific offers an exceptional inventory of microplate readers and scintillation counters. Absorbance, Fluorescence, Luminescence, Scintillation and Multi-Label readers are in stock with many configurations and options. Capabilities include Elisa, Fluorescence Intensity, Time-Resolved Fluorescence, Fluorescence Polarization, FRET, BRET, Flash and Glow Luminescence, DLR, Alpha-Screen, Scintillation and Gamma. 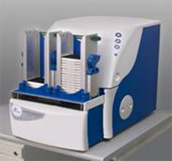 The Envision is Perkin Elmer's top-of-the-line multimode platereader. It's modular design offers such features as UV-Vis Absorbance, Fluorescence Intensity (top and bottom), TR-Fluorescence, FP, Luminescence, AlphaScreen (optional), Xenon flash lamp, stackers, incubation, 96/384/1536 well formats. Includes PC with Envision software. Perkin Elmer Wallac 1420-012 Victor 2 Multi-Label Microplate Reader. Reads Absorbance, Flash Absorbance, Fluorescence Intensity, Time-Resolved Fluorescence and Glow Luminescence. 96 and 384 well formats. Optional temperature control. Includes PC with Victor software. Reads Absorbance, Flash Absorbance, Fluorescence Intensity, Time-Resolved Fluorescence and Glow Luminescence. 20 position stackers; 96/384 well plate formats; temperature control (optional). Includes new PC w/ instrument control software. Model 1420-041. This is the top-of-the-line model in the Victor series. Reads Absorbance, Flash Absorbance, Fluorescence Intensity (top and bottom), Time-Resolved Fluorescence, Fluorescence Polarization and Glow Luminescence. Also includes temperature control and 20 position stackers. Reads 96 and 384 well formats. Includes new PC w/ Victor instrument control software. The Viewlux is Perkin Elmer's premiere high throughput screening microplate imaging system featuring a peltier-cooled CCD camera, up to 8 flash lamps, and plate formats up to 3456-well. Read modes include prompt fluorescence, TR, FP, Lance, Absorbance and Luminescence. Includes new PC plus all accessories and components. Fully loaded system in a compact footprint. Features Absorbance (UV-Vis), Fluorescence Intensity (top and bottom), Time-Resolved Fluorescence and Luminescence; 96/384/1536 plate formats with temperature control. Includes new PC w/ Perkin Elmer HT-Soft instrument control software. Reads top and bottom fluorescence. 96/384 well plate formats. Includes software and PC. Measures fluorescence intensity, top and bottom, 6 well to 96 well plates. Includes external halogen stabilized light source, PC and Packard software for instrument control and data analysis. High sensitivity luminescence reader. Accomodates 96 and 384 well plates with temperature control. Dual flash injectors for flash and glow luminescence applications. Includes PC with software. Next-generation luminescence reader with highest sensitivity in its class. Reads 96 well plates (384 well optional); 2 optional injectors for flash luminescence – “DLR-Ready”. Includes PC and software. Monochromator-based optics. 190-1000 nm wavelength range. Built-in cuvette port for reading standard 10mm cuvettes. Accomodates 96 and 384 well plates. Tunable endpoint reading and spectral scanning modes with temperature control. Includes PC and software. Monochromator-based optics for wavelength programming and excitation/emission spectral scanning. 96 and 384 well plate formats with temperature control. Includes PC and software. A fully-featured assay detection system that reads up to 1536 well plates. Reads Absorbance, Fluorescence Intensity, Time-Resolved Fluorescence, Fluorescence Polarization, Glow Luminescence and Flash Luminescence (dual injectors). Includes PC and software. A true high-throughput screening detection system without compromise. Reads Absorbance (Vis), Fluorescence Intensity, Time-Resolved Fluorescence, Fluorescence Polarization and Glow Luminescence. 96 and 384 well plate formats. Built-in plate stacking for walk-away convenience. Includes PC and software. Robotic-compatible washer for high-throughput screening in 384 well plates.